2015-04-03 Assigned to JOHNSON & JOHNSON VISION CARE, INC. reassignment JOHNSON & JOHNSON VISION CARE, INC. ASSIGNMENT OF ASSIGNORS INTEREST (SEE DOCUMENT FOR DETAILS). Assignors: SRIDHARAN, R., SURENDRAN, C., MUTHURKRISHNAN, SHARMILA, HANSEN, Leah, JOSLIN, SCOTT L., RAJA, RANGANATH, DAVIS, CARRIE L., VENKATASUBBAN, KUNISI, FADLI, ZOHRA, GEORGE, ERIC R., SCALES, CHARLES W., FORD, JAMES D., MAGGIO, THOMAS L., MAHADEVAN, SHIVKUMAR, VANDERLAAN, DOUGLAS G.
The present invention relates to ionic silicone hydrogel polymers comprising at least one pharmaceutical or nutriceutical component and displaying improved lysozyme uptake, low contact angle and reduced water soluble polymeric ammonium salt uptake. This application is a continuation-in-part of U.S. patent application Ser. No. 13/449,413, filed on Apr. 18, 2012 entitled MEDICAL DEVICES HAVING HOMOGENEOUS CHARGE DENSITY AND METHODS FOR MAKING SAME, the contents of which are incorporated by reference. The present invention relates to ionic silicone hydrogels, and ophthalmic devices formed therefrom, which display desirable tear and polycationic ophthalmic solution component uptake profiles and desirable drug uptake. 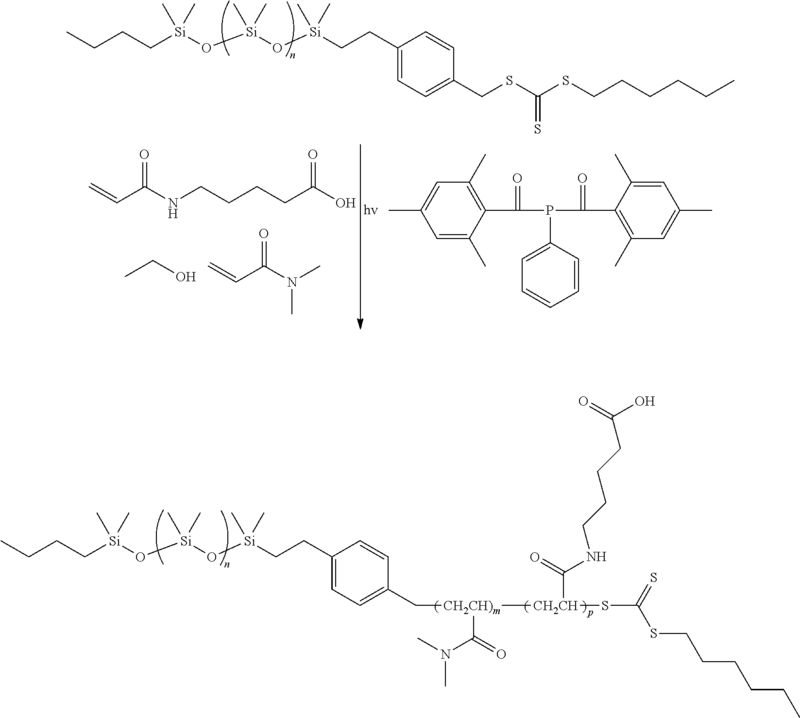 The present invention relates to anionic, silicone hydrogel contact lens comprising in or on said silicone hydrogel at least one statistical copolymer comprising units derived from at least 10 weight % of at least one non-ionic hydrophilic monomer and at least one anionic monomer and wherein said contact lens comprises at least one pharmaceutical or nutraceutical component and has a contact angle of about 70° or less, at least about 50 μg/lens lysozyme uptake, and less than about 10% uptake of at least one polycationic component when contacted with 3 mL of an ophthalmic solution comprising said 0.001 wt % polycationic component, 0.56% citrate dihydrate and 0.021% citric acid monohydrate (wt/wt). Contact lens multipurpose solutions frequently contain polycationic components. Polycationic components include positively charged organic compounds, such as cationic water soluble polymeric ammonium salts, such as biguanides, bisbiguanides and polyquaternium containing compounds, also called “polyquats” or PQ compounds. Polyhexamethylene biguanide (PHMB) is a common biguanide used in contact lens, multipurpose, cleaning and care solutions. Examples of water soluble polymeric ammonium salts include polycationic polymers having quartenary ammonium centers. 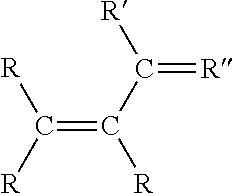 Examples include PQ-1, PQ-42 (poly[oxyethylene(dimethyliminio)ethylene (dimethyliminio)ethylene dichloride]), and the like. Cationic water soluble polymeric tetraalkyl phosphonium salts may also be used in place of the ammonium salts. 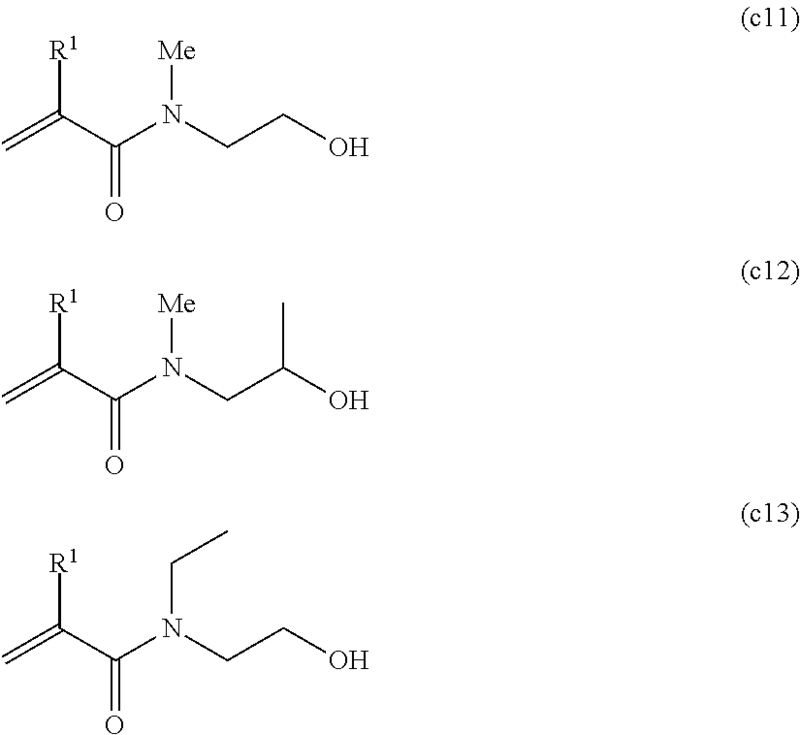 Non-polymeric cationic organic components having two or more cations such as chlorhexidine (N′,N′″″-hexane-1,6-diylbis[N-(4-chlorophenyl)(imidodicarbonimidic diamide)], or CHG), and the like may also be included. Inorganic charged ions, such as sodium ions are not cationic components as defined herein. Non-limiting examples of free radical reactive groups include (meth)acrylates, styryls, vinyls, vinyl ethers, C1-6alkyl(meth)acrylates, (meth)acrylamides, C1-6alkylmeth)acrylamides, N-vinyllactams, N-vinylamides, C2-12alkenyls, C2-12alkenylphenyls, C2-12alkenylnaphthyls, C2-6alkenylphenylC1-6alkyls, O-vinylcarbamates and O-vinylcarbonates. Non-limiting examples of cationic reactive groups (groups that can polymerize under cationic polymerization conditions) include vinyl ethers or epoxide groups and mixtures thereof. In one embodiment the reactive groups comprises (meth)acrylate, acryloxy, (meth)acrylamide, and mixtures thereof. When rA=rB>1, blocky-type copolymers are formed. In this case monomer A has a high probability of adding to itself over monomer B and monomer B has a high probability of adding to itself over monomer A. In extreme cases, where A would rarely add to B and vice versa, i.e. where rA=rB>>1, formation of a mixture of homopolymers is anticipated. 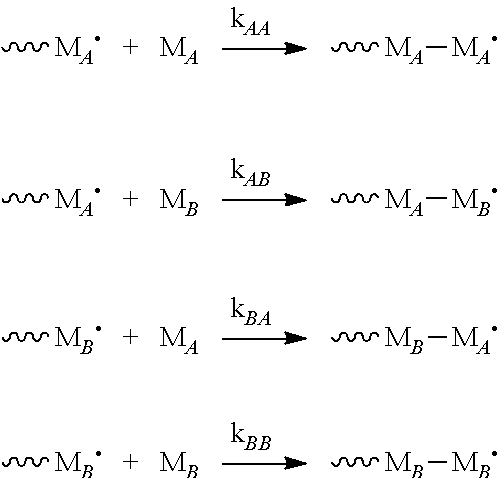 These cases are believed to produce a heterogeneous distribution of charge in and on the resulting substrate. Examples of suitable anionic components include reactive carboxylic acids, including alkylacrylic acids, such as (meth)acrylic acid, acrylic acid, itaconic acid, crotonic acid, cinnamic acid, vinylbenzoic acid, fumaric acid, maleic acid, monoesters of furmaric acid, maelic acid and itaconic acid; 3-acrylamidopropionic acid, 4-acrylamidobutanoic acid, 5-acrylamidopentanoic acid, N-vinyloxycarbonyl-α-alanine, N-vinyloxycarbonyl-β-alanine (VINAL), 2-vinyl-4,4-dimethyl-2-oxazolin-5-one (VDMO), reactive sulphonate salts, including sodium-2-(acrylamido)-2-methylpropane sulphonate, 3-sulphopropyl (meth)acrylate potassium salt, 3-sulphopropyl (meth)acrylate sodium salt, bis 3-sulphopropyl itaconate di sodium, bis 3-sulphopropyl itaconate di potassium, vinyl sulphonate sodium salt, vinyl sulphonate salt, styrene sulphonate, 2-sulphoethyl methacrylate and mixtures thereof and the like. In one embodiment the anionic component is selected from reactive carboxylic acids, in another from methacrylic acid and N-vinyloxycarbonyl alanine. In another embodiment, where the reactive monomers comprise acrylamido reactive groups the anionic monomer comprises an acrylamide acid, such as 3-acrylamidopropionic acid, 4-acrylamidobutanoic acid, 5-acrylamidopentanoic acid, 2-acrylamido-2-methylpropane sulphonic acid, salts of said acrylamido acids and combinations thereof. Suitable salts include ophthalmically compatible salts including sodium, potassium and calcium salts. When the major polymerizable components comprise (meth)acrylate functionality the anionic monomer may be (meth)acrylic acid, itaconic acid, crotonic acid, cinnamic acid, fumaric acid, maleic acid, monoesters of furmaric acid, 3-sulphopropyl (meth)acrylate potassium salt, 3-sulphopropyl (meth)acrylate sodium salt, bis 3-sulphopropyl itaconate di sodium, bis 3-sulphopropyl itaconate di potassium, sulphoethyl methacrylate, and mixtures thereof. In another embodiment the major polymerizable components comprise (meth)acrylate functionality, and the anionic monomer may be (meth)acrylic acid, 3-sulphopropyl (meth)acrylate potassium salt, 3-sulphopropyl (meth)acrylate sodium salt, sulphoethyl methacrylate, and mixtures thereof. In one embodiment, the hydrophobic block comprises polydialkylsiloxane, polydiarylsiloxane and mixtures thereof. The alkyls may be independently selected from C1-C4 alkyl, and in one embodiment the hydrophobic block comprises polydimethylsiloxane or polydiethylsiloxane, either of which may be terminated by a C1-12 alkyl, C1-C4 alkyl, aryl or in some embodiments methyl or n-butyl. As used herein “monovalent reactive groups” are groups that can undergo polymerization such as free radical, anionic and/or cationic polymerization. Non-limiting examples of free radical reactive groups include (meth)acrylates, styryls, vinyls, vinyl ethers, substituted or unsubstituted C1-6alkyl(meth)acrylates, (meth)acrylamides, substituted or unsubstituted C1-6alkyl(meth)acrylamides, N-vinyllactams, N-vinylamides, C2-12alkenyls, C2-12alkenylphenyls, C2-12alkenylnaphthyls, C2-6alkenylphenylC1-6alkyls, O-vinylcarbamates and O-vinylcarbonates. Suitable substituents on said C1-6 alkyls include ethers, hydroxyls, carboxyls, halogens and combinations thereof. Non-limiting examples of cationic reactive groups include vinyl ethers or epoxide groups and mixtures thereof. In one embodiment the free radical reactive groups comprises (meth)acrylate, acryloxy, (meth)acrylamide, and mixtures thereof. In one embodiment on R1 is selected from C1-6alkyl(meth)acrylates, and C1-6alkyl(meth)acrylamides, which may be unsubstituted or substituted with hydroxyl, alkylene ether or a combination thereof. In another embodiment R1 is selected from propyl(meth)acrylates and propyl (meth)acrylamides, wherein said propyl may be optionally substituted with hydroxyl, alkylene ether or a combination thereof. In one embodiment b is zero, one R1 is a monovalent reactive group, and at least 3 R1 are selected from monovalent alkyl groups having one to 16 carbon atoms, and in another embodiment from monovalent alkyl groups having one to 6 carbon atoms. 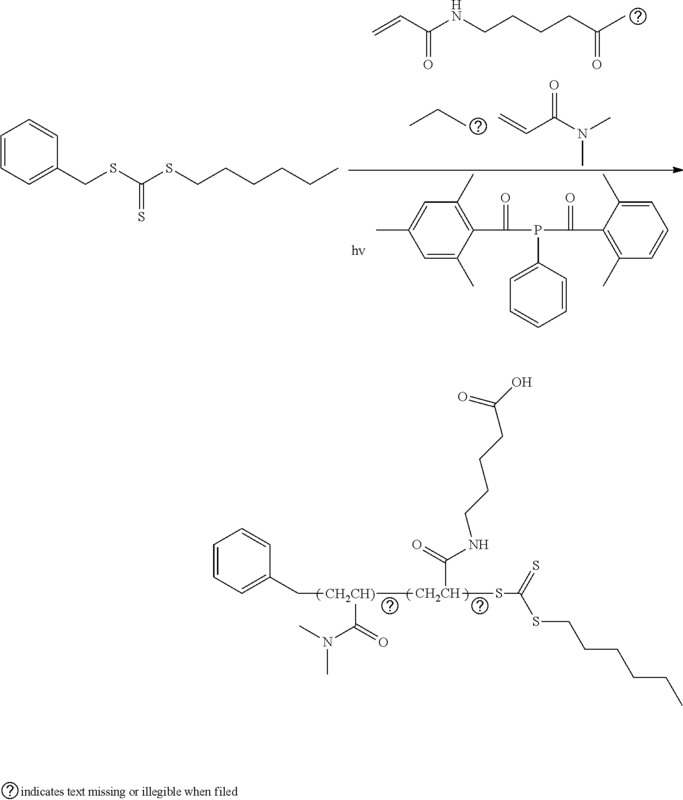 Non-limiting examples of silicone components of this embodiment include 2-methyl-,2-hydroxy-3-[3-[1,3,3,3-tetramethyl-1-[(trimethylsilyl)oxy]disiloxanyl]propoxy]propyl ester (“SiGMA”), 2-hydroxy-3-methacryloxypropyloxypropyl-tris(trimethylsiloxy)silane, 3-methacryloxypropyltris(trimethylsiloxy)silane (“TRIS”), 3-methacryloxypropylbis(trimethylsiloxy)methylsilane and 3-methacryloxypropylpentamethyl disiloxane. In one embodiment a diluent is used having a polarity sufficiently low to solubilize the non-polar components in the reactive mixture at reaction conditions. One way to characterize the polarity of the diluents of the present invention is via the Hansen solubility parameter, δp. In certain embodiments, the δp is less than about 10, and preferably less than about 6. Suitable diluents are further disclosed in U.S. Ser. No. 60/452,898 and U.S. Pat. No. 6,020,445. Aqueous solutions are solutions which comprise water. In one embodiment the aqueous solutions of the present invention comprise at least about 30% water, in some embodiments at least about 50% water, in some embodiments at least about 70% water and in others at least about 90 weight % water. Aqueous solutions may also include additional water soluble components such as the uncrosslinked statistical copolymers of the present invention, release agents, wetting agents, slip agents, pharmaceutical and nutraceutical components, combinations thereof and the like. Pharmaceutical and nutraceutical components are known and include cationic drugs and neutriceuticals. Examples include those for the treatment of dry eye mitigation and/or prevention (including contact lens related dry eye, excessive tear evaporation and Non-Sjogren's aqueous tear deficiency), glaucoma, allergies (including antihistimines and mast cell inhibitors), ocular inflammation, ocular redness, ocular itching, bacterial, viral and fungal infections, prevention or slowing of myopia progression, and anaesthetics. Examples of cationic drugs include atropine, pirenzepine, doxycycline, brimonidine, brinzolamide, dorzolamide, betaxolol, apraclonidine, ccr2 antagonist, olopatadine, alcaftadine, betaxolol, bupivacaine, carbachol, carteolol, chlortetracycline, cyclopentolate, dibutoline, dipivefrin, ephedrine, erythromycin, gentamycin, gramicidin, homatropine ketotifen, levobunolol, levocabastine, lidocaine, lignocaine, lomefloxacin, mepivacaine, naphazoline, neomycin, ofloxacin, oxybuprocaine, pheniramine, physostigmine, pilocarpine, polymyxin B, proparacaine, pyrilamine, tetracaine, tetracycline, tetrahydrozoline, timolol, tropicamide, vidarabine, pharmaceutically acceptable salts thereof and combinations thereof and the like. In another embodiment suitable pharmaceutical components include atropine, pirenzepine, doxycycline, brimonidine, brinzolamide, dorzolamide, betaxolol, apraclonidine, ccr2 antagonist, olopatadine, alcaftadine, betaxolol, bupivacaine, carbachol, carteolol, chlortetracycline, cyclopentolate, dibutoline, dipivefrin, erythromycin, gentamycin, gramicidin, homatropine ketotifen, levobunolol, levocabastine, lidocaine, lignocaine, lomefloxacin, mepivacaine, naphazoline, ofloxacin, pheniramine, physostigmine, pilocarpine, polymyxin B, proparacaine, pyrilamine, tetracaine, tetrahydrozoline, timolol, tropicamide pharmaceutically acceptable salts thereof and combinations thereof and the like. In another embodiment the cationic drugs include atropine, ketotifen, olopatadine, alcaftadine, levocabastine, pirenzepine, doxycycline, brimonidine, brinzolamide, dorzolamide, betaxolol, apraclonidine, ccr2 antagonist, olopatadine pharmaceutically acceptable salts thereof and combinations thereof and the like. The drugs may be incorporated into the lenses in a symptom mitigating effective amount. Suitable amounts will vary for each drug, but include those between about the weight of the drug contained in an ophthalmic device prior to its use by a patient wherein such minimum effective amount alleviates the symptoms of the condition being treated. The minimum effective amount may vary depending upon the efficacy of a particular drug. General ranges include between about 5 μg and about less than 200 μg, and in some embodiments between about 9 μg and about less than 100 μg, with the symptom mitigating effective amount being selected to achieve the desired clinical result while minimizing undesired side effects. For example, if the anti-allergic agent is ketotifen fumarate, the minimum effective amount is between greater than about 9 μg and about less than 90 μg, more particularly between about 40 μg and greater than about 9 μg, most preferably about 20 μg. It is preferred that the minimum effective amount of drug alleviates the symptoms for between about 5 minutes, and about 24 hours from insertion of the ophthalmic device into the eye of a user, more preferably between about 5 minutes and about 16 hours, most preferably between about 5 minutes and about 12 hours. Thus in one embodiment the lenses of the present invention display uptake efficiencies greater than about 200, greater than about 250, and in some embodiments, greater than about 300. While efficiency in the uptake of drug is increased, the uptake in polycationic ophthalmic solution component uptake, such as PQ1 uptake is maintained at a desirable level. The ionic silicone hydrogel polymers of the present invention also display stable modulus. As used herein, stable modulus are those which increase less than about 30%, and in some embodiments less than about 20% over three autoclave cycles (20 minutes at 121° C.). In some embodiments the silicone hydrogel polymers of the present invention display modulus that increase by less than about 20% over 20 weeks over three autoclave cycles. In another embodiment, the ionic silicone hydrogels of the present invention display modulii which change less than about 30%, about 20% or even less than about 10% over 12 or 18 months at 25° C. and ambient humidity. Still further the invention includes a method of making an ophthalmic device comprising about a minimum effective amount of an anti-allergic agent comprising the step of treating an ophthalmic device with a solution comprising said anti-allergic agent, wherein the amount of said anti-allergic agent in said solution exceeds the minimum effective amount. It is preferred that the minimum effective amount is exceeded by between about 1.0% and about 1000%, in a volume of solution that is between about 500 μL and about 5000 μL preferably between about 50% and about 500%, in a volume of solution that is between about 500 μL and about 3000 μL most preferably about 50% in a volume of solution that is about 1000 μL. As used herein treating means physical methods of contacting the solution containing an anti-allergic agent and the ophthalmic device. Preferably treating refers to physical methods of contacting the anti-allergic agent with the ophthalmic devices prior to selling or otherwise delivering the ophthalmic devices to a patient. The ophthalmic devices may be treated with the anti-allergic agent anytime after they are polymerized. Release agents are compounds or mixtures of compounds which, when combined with water, decrease the time required to release a contact lens from a mold, as compared to the time required to release such a lens using an aqueous solution that does not comprise the release agent. In one embodiment the aqueous solutions comprise less than about 10 weight %, and in others less than about 5 weight % organic solvents such as isopropyl alcohol, and in another embodiment are free from organic solvents. In these embodiments the aqueous solutions do not require special handling, such as purification, recycling or special disposal procedures. Lysozyme uptake was measured as follows: The lysozyme solution used for the lysozyme uptake testing contained lysozyme from chicken egg white (Sigma, L7651) solubilized at a concentration of 2 mg/ml in phosphate saline buffer supplemented by Sodium bicarbonate at 1.37 g/l and D-Glucose at 0.1 g/l. N,N-dimethylacrylamide (DMA) and further purified via vacuum distillation. 5-acrylamidopentanoic acid (ACA2) was prepared according to Synthesis 3 The siloxy-functional benzyltrithiocarbonate, S-XG-1996-S′-hexyl-trithiocarbonate, was prepared according to Synthesis 1, above. Irgacure 819 was dissolved in D3O (10 mg/mL). N,N-dimethylacrylamide (DMA) was purified via vacuum distillation. 5-acrylamidopentanoic acid (ACA2) was prepared according to Synthesis 3. The siloxy-functional benzyltrithiocarbonate, S-XG-1996-S′-hexyl-trithiocarbonate, was prepared according to Synthesis 1. Irgacure 819, was obtained from Ciba Specialty Chemicals and dissolved in D30 (10 mg/mL). A base reactive mixture having the components listed in Table 4, below was made by mixing the components in the amounts listed with t-amyl alcohol (55 wt % components: 45 wt % t-amyl alcohol). Separate formulations were made adding 3 mol % of the ionic component listed in Table 5, below. The formulations were stirred on a jar roller for 2 hours, and then filtered. Each reactive mixture was degassed, dosed into molds (Zeonor FC/polypropylene BC) and cured for 5 minutes, at about 55° C., about 2.25 mW/cm2 intensity, and about 0.2% O2. The molds were separated by hand. The lenses were released and extracted in 70/30 IPA/DI and finally hydrated in standard packing solution. The lenses were sterilized at 121° C. for 20 minutes. The sterilized lenses were tested for lysozyme and PQ1 uptake. The formulation in Table 9 contains both methacrylate components (HO-mPDMS, HEMA and mPDMS) as well as acrylamide components (DMA). Comparative Examples 10-13 show that such systems cannot provide the desired balance of lysozyme uptake greater than 50 μg/lens and PQ1 uptake of less than about 10%. 1. An anionic, silicone hydrogel contact lens comprising in or on said silicone hydrogel at least one statistical copolymer comprising units derived from at least 10 weight % of at least one non-ionic hydrophilic monomer and at least one anionic monomer and wherein said contact lens comprises at least one pharmaceutical or nutraceutical component and has a contact angle of about 70° or less, at least about 50 μg/lens lysozyme uptake, and less than about 10% uptake of at least one polycationic component when contacted with 3 mL of an ophthalmic solution comprising said 0.001 wt % polycationic component, 0.56% citrate dihydrate and 0.021% citric acid monohydrate (wt/wt). 2. The contact lens of claim 1 wherein said statistical copolymer is non-reactive and is associated with or entangled in said silicone hydrogel contact lens. 3. The contact lens of claim 2 wherein said statistical copolymer comprises about 20 to about 80 mol % units from said anionic monomer. 4. The contact lens of claim 2 wherein said statistical copolymer comprises about 20 to about 60 mol % units from said anionic monomer. 5. The contact lens of claim 3 wherein said statistical copolymer comprises about 80 to about 20 mol % units from said non-ionic hydrophilic monomer. 6. The contact lens of claim 3 wherein said statistical copolymer comprises about 80 to about 40 mol % units from said non-ionic hydrophilic monomer. 7. The contact lens of claim 2 wherein said statistical copolymer is associated with at least part of said silicone hydrogel contact lens. 8. The contact lens of claim 18 wherein said statistical copolymer is present in or on said contact lens in a concentration sufficient to provide a concentration of units from said anionic monomer of about 0.1 to about 5 mol %. 9. The contact lens of claim 18 wherein said statistical copolymer is present in or on said contact lens in a concentration sufficient to provide a concentration of units from said anionic monomer of about 0.2 to about 4 mol %. 11. The contact lenses of claim 2 wherein said non-reactive statistical copolymer further comprises a hydrophobic block on at least one terminus. 12. The contact lens of claim 11 wherein said hydrophobic block comprises polydialkylsiloxane, polydiarylsiloxane and mixtures thereof. 13. The contact lens of claim 12 wherein said alkyl is selected from C1-C4 alkyl. 14. The composition of claim 12 wherein said hydrophobic block comprises polydimethylsiloxane or polydiethylsiloxane. 15. The contact lens of claim 12 wherein said hydrophobic block comprises between about 6 and about 200 siloxy units. 16. The contact lens of claim 12 wherein said hydrophobic block comprises between about 6 and about 200 siloxy units. 17. The contact lens of claim 2 wherein said units from said non-ionic hydrophilic monomer and said anionic monomer when polymerized have a degree of polymerization of at least about 300. 18. The contact lens of claim 1 wherein said silicone hydrogel is said statistical copolymer. 19. The contact lens of claim 1, 2 or 18 wherein said anionic monomer and said non-ionic hydrophilic monomer have the same reactive functionality. 20. The contact lenses of claim 19 wherein said anionic monomer and said non-ionic hydrophilic monomer are selected from (meth)acrylamides. 21. The contact lenses of claim 19 wherein said anionic monomer and said non-ionic hydrophilic monomer are selected from (meth)acrylates. 22. The contact lenses of claim 19 wherein said anionic monomer and said non-ionic hydrophilic monomer are selected from vinyls. 23. The contact lens of claim 1 wherein said lysozyme uptake is at least about 70 μg/lens. 24. The contact lens of claim 1 wherein said lysozyme uptake is at least about 100 μg/lens. 25. The contact lens of claim 1 wherein said polycationic component is selected from the group consisting of cationic water soluble polymeric ammonium salts, polyquaternium containing compounds, water soluble polymeric tetraalkyl phosphonium salts and mixtures thereof. 26. The contact lens of claim 1 wherein said polycationic component is selected from the group consisting of biguanides, bisbiguanides, polycationic polymers having quartenary ammonium centers and combinations thereof. 27. The contact lens of claim 1 wherein said polycationic component is selected from the group consisting of polyhexamethylene biguanide PQ-1, PQ-42, and mixtures thereof. 28. The contact lens of claim 1 further comprising a water content of between about 20% and about 70%. 29. The contact lens of claim 1 further comprising a water content of between about 25% and about 65%. 30. The contact lens of claim 20 wherein said anionic monomer is selected from the group consisting of 3-acrylamidopropionic acid, 4-acrylamidobutanoic acid, 5-acrylamidopentanoic acid, sodium-2-(acrylamido)-2-methylpropane sulphonate, 2-acrylamido-2-methylpropane sulfonic acid and combinations thereof. 31. The contact lens of claim 21 wherein said anionic monomer is selected from the group consisting of (meth)acrylic acid, acrylic acid, 3-sulphopropyl (meth)acrylate potassium salt, 3-sulphopropyl (meth)acrylate sodium salt, sulphoethyl methacrylate, and mixtures thereof. 32. The contact lens of claim 21 wherein said anionic monomer comprises (meth)acrylic acid. 33. 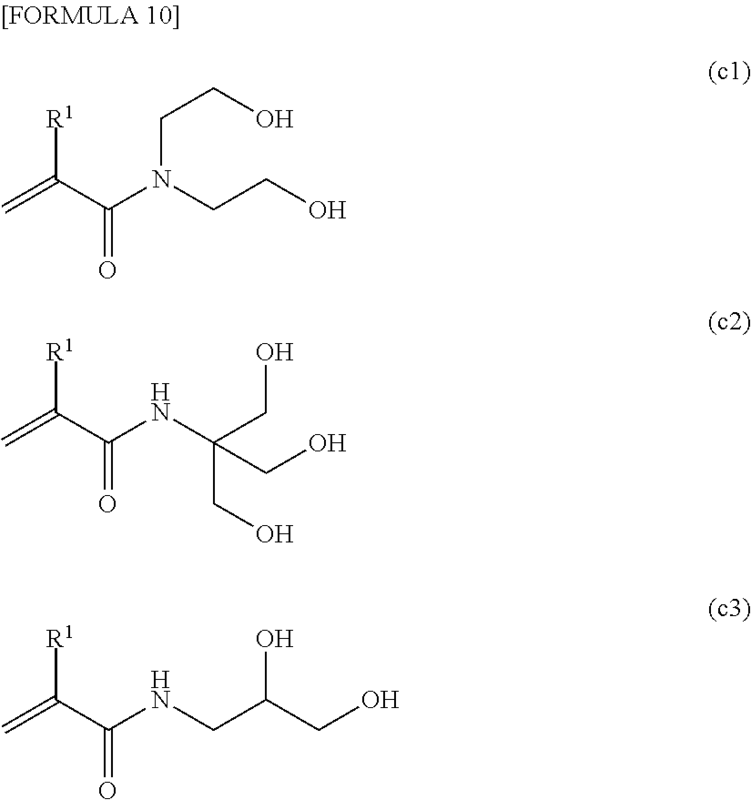 The contact lens of claim 21 wherein said anionic monomer is selected from the group consisting of N-vinyloxycarbonyl-α-alanine, N-vinyloxycarbonyl-β-alanine, 2-vinyl-4,4-dimethyl-2-oxazolin-5-one, vinyl sulphonate sodium salt, vinyl sulphonate salt, and mixtures thereof. 35. The silicone hydrogel of claim 34 wherein said single reactive functionality is selected from the group consisting of acrylate, methacrylate, acrylamide, methacrylamide, vinyl and styryl. 36. The silicone hydrogel of claim 34 wherein said single reactive functionality is selected from the group consisting of acrylamide, methacrylamide and vinyl. 37. A silicone hydrogel contact lens comprising between about 50 ppm and about 1 wt % of at least one uncrosslinked statistical copolymer comprising at least about 10 weight % of at least one non-ionic hydrophilic monomer and at least about 20 mol % of at least one anionic repeating unit distributed randomly throughout said polymer. 38. The contact lens of claim 37 wherein said copolymer is present in an amount between about 20 ppm and 2000 ppm. 39. The contact lens of claim 37 wherein said copolymer is present in an amount between about 50 ppm and 1500 ppm. 40. 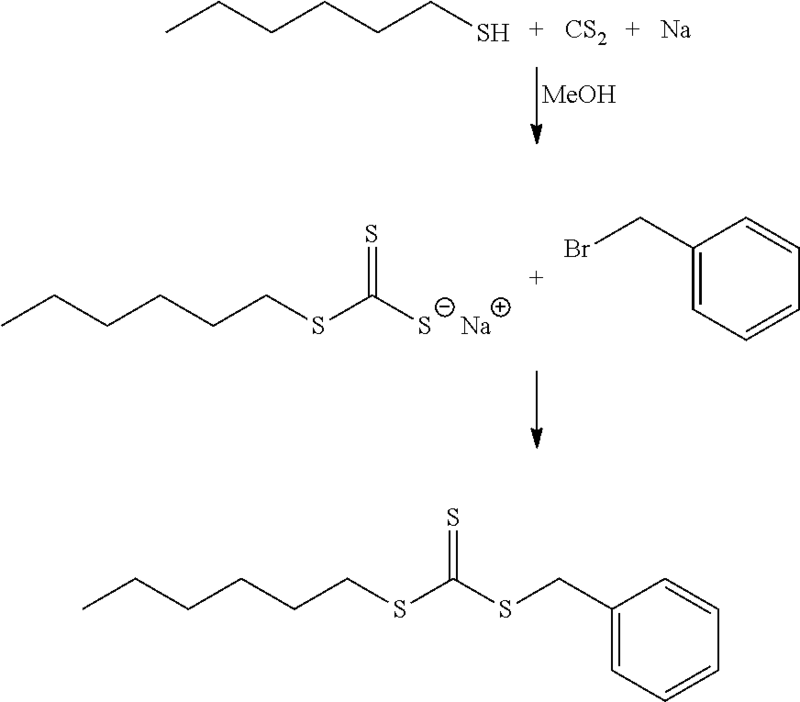 The silicone hydrogel of claim 34 wherein said single reactive functionality is methacrylamide and said reactive ionic monomer comprises at least one acrylamido sulphonic acid or acrylamido sulphonic acid salt. 41. The silicone hydrogel of claim 40 wherein said acrylamido sulphonic acid comprises an alkylene group comprising 2 to 4 carbon atoms. 42. The silicone hydrogel of claim 40 wherein said acrylamido sulphonic acid comprises 2-acrylamido-2-methylpropane sulfonic acid salt. 43. The contact lens of claim 1 wherein said at least one pharmaceutical pharmaceutical or nutraceutical component is cationic. 44. The contact lens of claim 1 wherein said at least one pharmaceutical pharmaceutical or neutraceutical component is selected from the group consisting of atropine, pirenzepine, doxycycline, brimonidine, brinzolamide, dorzolamide, betaxolol, apraclonidine, ccr2 antagonist, olopatadine, alcaftadine, betaxolol, bupivacaine, carbachol, carteolol, chlortetracycline, cyclopentolate, dibutoline, dipivefrin, ephedrine, erythromycin, gentamycin, gramicidin, homatropine ketotifen, levobunolol, levocabastine, lidocaine, lignocaine, lomefloxacin, mepivacaine, naphazoline, neomycin, ofloxacin, oxybuprocaine, pheniramine, physostigmine, pilocarpine, polymyxin B, proparacaine, pyrilamine, tetracaine, tetracycline, tetrahydrozoline, timolol, tropicamide, vidarabine, pharmaceutically acceptable salts thereof and combinations thereof and the like. 45. The contact lens of claim 1 wherein said at least one pharmaceutical pharmaceutical or neutraceutical component is selected from the group consisting of atropine, pirenzepine, doxycycline, brimonidine, brinzolamide, dorzolamide, betaxolol, apraclonidine, ccr2 antagonist, olopatadine, alcaftadine, betaxolol, bupivacaine, carbachol, carteolol, chlortetracycline, cyclopentolate, dibutoline, dipivefrin, erythromycin, gentamycin, gramicidin, homatropine ketotifen, levobunolol, levocabastine, lidocaine, lignocaine, lomefloxacin, mepivacaine, naphazoline, ofloxacin, pheniramine, physostigmine, pilocarpine, polymyxin B, proparacaine, pyrilamine, tetracaine, tetrahydrozoline, timolol, tropicamide pharmaceutically acceptable salts thereof and combinations thereof and the like. 46. The contact lens of claim 1 wherein said at least one pharmaceutical pharmaceutical or nutraceutical component is selected from the group consisting of atropine, ketotifen, olopatadine, alcaftadine, levocabastine, pirenzepine, doxycycline, brimonidine, brinzolamide, dorzolamide, betaxolol, apraclonidine, ccr2 antagonist, olopatadine pharmaceutically acceptable salts thereof and combinations thereof and the like. 47. The contact lens of claim 1, 44, 45 or 46, wherein said at least one pharmaceutical or nutraceutical component in a symptom mitigating effective amount. 48. The contact lens of claim 47 wherein said symptom mitigating effective amount is between about 5 μg and about less than 200 μg. 49. The contact lens of claim 47 wherein said symptom mitigating effective amount is between about 9 μg and about 100 μg. 50. The contact lens of claim 47 wherein said symptom mitigating effective amount alleviates symptoms for between about 5 minutes, and about 12 hours from insertion of said contact lens on a human's eye. 51. The contact lens of claim 47 wherein said contact lens comprises a modulus which increases less than about 30% after three autoclave cycles. AT19639T (en) 1981-11-27 1986-05-15 Tsuetaki George F Polymers for contact lenses and contact lenses based on these polymers.